Jeannie was born and raised in Kentucky. 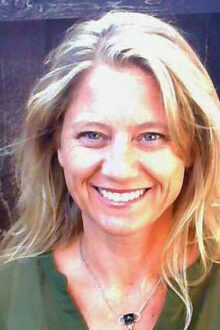 Enchanted by the mountains, she relocated to Taos after graduating from Tulane University in 1991. She has focused her career on supporting families and children. She has been a teacher, home visitor, parent educator, and program coordinator. She is a certified Love and Logic, Circle of Security, Nurturing Parenting, and Infant Massage instructor. She earned her Infant Mental Health Endorsement – Level II in 2013 and is certified in the FAN Level 2. She accepted the position of Director of the Community Health Services Department at Holy Cross Medical Center in Taos in October 2017 and was elected as a board member of the New Mexico Infant Mental Health Association in January 2018. Jeannie is passionate about supporting her community through promoting healthy family relationships with a focus on early childhood. She presented a poster at the 2017 Annual Zero to Three convention highlighting the work of Taos First Steps. She is currently working towards earning a Master’s in Family and Human Development at Arizona State University and looks forward to graduating in December 2018. She has two daughters, both of whom challenge and delight her every day. When not working or studying, she loves to snowboard and hike in the beautiful Sangre de Cristo Mountains.